Do you don't what Is MPPT ? MPPT stands for Maximum Power Point Tracking. This is a simple explanation on how MPPT works and why we recommend using it for your off grid or RV solar power system. Simply put, MPPT is an electronic method of capturing the most power from your PV solar modules (a.k.a. solar panels). MPPT controllers will convert the module operating voltage to battery voltage and raise the output current (amperage or amps) in the process. The word “tracking" has nothing to do with mechanically moving the PV modules to track the sun. All PV solar modules are rated in Watts. This identifies the potential power that a PV module can produce. This power is the amount of work that the module can do when it is illuminated with sunlight. Multiply the operating voltage (Vmp) by the operating current (Imp) listed on the label and you will have the Wattage of the module. Voc and Isc refer to other measurements and are not used in calculating power. For example, we sell a 240 Watt solar module is rated at 8.1 Imp at 29.7 Vmp. Here's the math: 29.7 X 8.1 = 240 Watts. 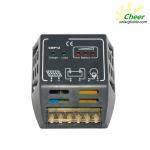 The PV module MUST operate at 29.7 volts AND 8.1 amps in order to produce the 240 Watts of power. It is important to understand that a solar module is a constant current device. That means for a given amount of sunlight, the current stays the same but the voltage can be pulled down by a load. How Non-MPPT (PWM) Charge Controllers Work ? All non-MPPT (PWM) charge controllers do the same basic thing: they connect the PV module directly to the battery. The battery acts as a load which will pull down the PV module operating voltage. In our example above, the Vmp of 29.7 volts is pulled down to battery voltage. Here's an example: If you had a battery at 12.7 volts and connected the 240 Watt PV module, you would still have the 8.1 amps of charge current. 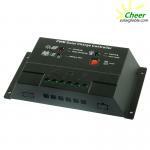 However, the operating voltage will be pulled down to the battery voltage so you will only be using 103 Watts. Here's the math: 12.7 X 8.1 = 103 Watts. The non-MPPT charge controller will keep pushing the battery voltage up until it reaches the set point of the charge controller. If your charge controller is set to regulate at 14.4 volts, the most you can ever use from the 240 watt module is 117 watts! (14.4 volts X 8.1 amps = 117 Watts) In order to capture the full 240 watts that the module can produce, you must convert the power so that the PV module can operate at 29.7 volts. This is why MPPT charge controller were developed. How does MPPT Charge Controllers Work ? MPPT circuits use this process to lower the voltage close to the battery voltage while raising the current. As long as the voltage reaching the MPPT controller is higher than the battery voltage by about 5% or more, then the MPPT output current will be higher than the input. With the PV module described above, we have the potential of 240 Watts of power. With the MPPT controller connected to this module, the DC converter can output over 16 amps while regulating the voltage to 14.4. (16.7 X 14.4 = 240 watts). Why MPPT Is So Important ? All types of solar installations will benefit by using MPPT technology. The higher the module operating voltage (Vmp) the more benefit you will gain by using MPPT. Recreational Vehicles (RV) have very limited roof space for solar modules. If you do not tilt the modules, considerable power is lost in the winter months due to the low angle of the sun. Because of these limitations, it is very important to transfer all the power you can by using MPPT technology. For off-grid systems, MPPT will allow you to wire the PV modules in series for high voltage, even up to 600 volts DC! This is extremely beneficial for long wire runs as the higher the operating voltage, the smaller the wire can be for a given length. Consider this: If you only gain 100 Watts by using MPPT technology, it is still very worthwhile. 100 Watts increase can add up to more than 180,000 Watt-hours, or 180 kWh more each year! There are other factors that are important to understand when designing a PV solar charging system for optimum performance. Feel free to contact me if you have questions. 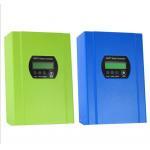 Previous： 2014 new 3rd generation MPPT solar controller on sale now!